Sculpture Information: Click on the Current Work link. Below each video is a link to more information and prices. Follow those links for much more info about each design. Purchasing: Wood that Works is in a wonderful yet awkward place. 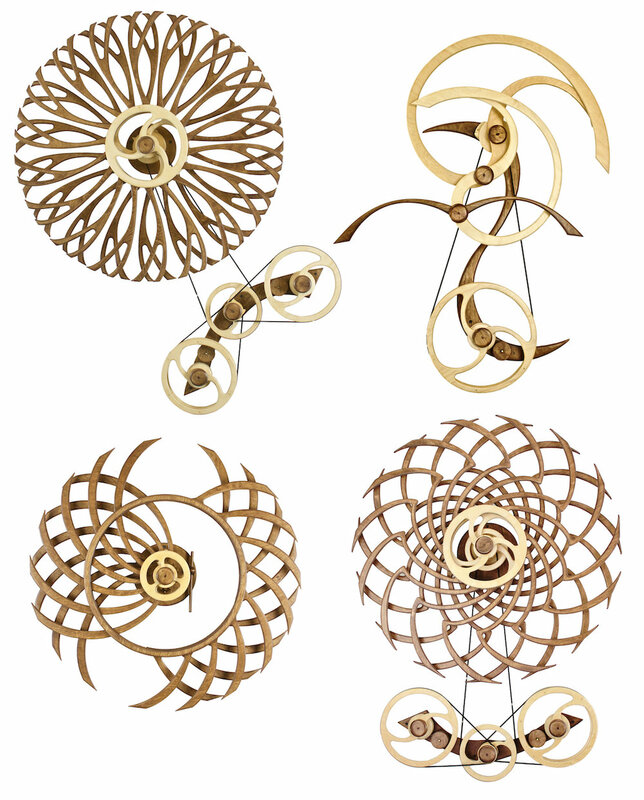 David’s kinetic sculptures have been selling extremely well and as a result the back order list has gotten much longer than is comfortable. While it is very rewarding that so many people want to have one of his sculptures David does not want to hold deposits for sculptures to be delivered far in the future. It isn’t fair to the collector. David also doesn’t want to be tied to a fixed schedule. He has too many new ideas he wants to try. We have decided to create an “active interest list” for 2018. David will continue making sculptures. There will be both new designs and production of existing editions with sculptures still available like Duality and Kindala-Forest. However we will not take orders until we have something finished and ready to ship. We will email the folks on the “active interest list” so they can have the first opportunity to buy. David will also use this active interest list to help him decide which of the existing designs to make next. If you would like to be on this active interest list, please complete the form below (on mobile) or to the right (on computer) and submit it to us at Wood That Works. We will be in touch via email in the months to come! International Interest? David has been shipping his sculptures to many foreign countries for years but there are some that are currently too challenging for many different reasons. We do not ship to China, Russia, India, or Vietnam. Don’t forget to click submit at the bottom! List your favorite design or add any additional information here. How did you find out about David's work? Follow this link for additional general ordering information including shipping, international sales, and availability.